GEO offers an extremely rich source of transcriptional profile data, but downloading and preparing a dataset is often an obstacle to aspiring bioinformaticians. I’ll walk you through one way to do it using the Leucegene dataset as an example. Once this data is loaded and ready to use in R, I’ll then present a very simplified and practical perspective on the use of PCA for exploratory analysis. This data is presented in what is often called a long format: each row represent a single expression value and the first few columns identify the gene. Here, we will combine columns #1-4 to act as the gene name and keep column #5 as the expression value (measured in RPKM). To those familiar with ggplot2, you will recognize that this long format is the preferred one of this great graphing package. As an aside, it is also extremely convenient when working with “lm” and “glm”! But here, I will convert this format into a more traditional matrix format where rows represent genes and columns represent patients. This is sometimes referred to as a wide format and is easily performed using “acast” from the “reshape2” package (the reshape package provides functions to convert to and from long and wide formats). Finally, I’ll transform the RPKM values using the started-log transform. Data is loaded and ready to be analyzed… but where to start? It is a good idea to spend some time exploring a new dataset in an undirected fashion. A great tool to apply for this purpose is the PCA. Although you’ll find numerous texts detailing the precise mathematical underpinnings of the PCA (I’ll refer the curious readers to the exhaustive presentation of Jolliffe 1986 (link)), I like to think of PCA as defining a series of gene signatures in which every gene has a specific weight. 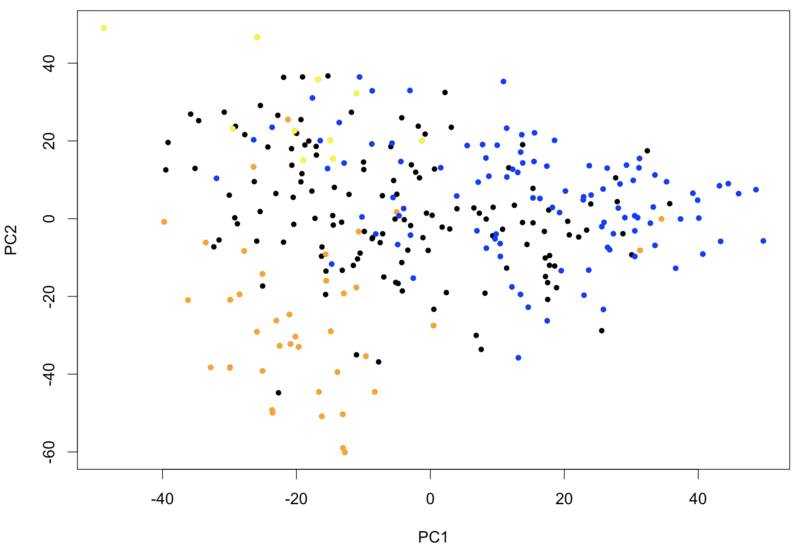 The first signature (called the first component in PCA jargon or PC1 in R) identifies the genes that can best differentiate samples of the dataset. If you would take each transcriptional profile and multiply gene expressions by the weights given by this first component and sum this into a unique score, this score would capture as much variance from the dataset as is possible using a single value. The second component (or signature) will be orthogonal to the first, meaning that it will capture variance that is independent from that captured with the first component. And so on with following components. Using the PCA, we thus replace each transcriptional profile (24,553 gene expressions per sample) by a set of values (the scores describe above) in such a way that this transformation preserves the variations observed in the complete dataset. The “rotation” variable contains the signatures (components) as columns, and “predict” is used to compute the “scores” of those signatures for each of our samples. With this type of representation, it is very easy to identify outliers. If samples fall into easily distinguishable classes, this would also show. To further show the usefulness of PCA as first exploratory step, the following piece of code will identify the samples corresponding to leukemias belonging to FAB classes M0-1 (M0 and M1 combined), M5 and M6. These types of leukemias are known to have somewhat characteristic expression profiles. The output of the PCA clearly shows that PC1 (the main PCA “signature”) defines characteristics of the M0-1 and PC2 allows to distinguish between M5 and M6. Figure 1: PCA of 285 patient samples from Leucegene shown using the first two principal components. Colors corresponds to FAB classification with M0 and M1 shown in blue, M5 in orange and M6 in yellow.